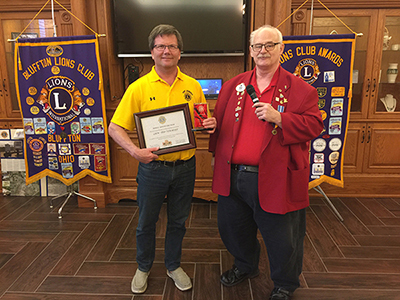 FORT JENNINGS —Fort Jennings Lion Club member Ted Verhoff has been named Lion of the Year for Zone E, District 13 in Ohio. Verhoff was nominated by Tom Gilchriest. “On behalf of the Fort Jennings Lions Club, I would like to nominate Ted Verhoff to be considered for the district Lion of the year award. Ted is always very active in most of all of the Lion’s projects that our club is involved in,” Gilchriest wrote in his nomination. According to Gilchriest’s letter of recommendation, Verhoff played a big role in building both the shelter house and concession stand at the Fort Jennings Park, using his own tools and equipment and was present for almost every day of the labor. He had a big part in the brick and concrete work done by the Lions that surrounds the baseball field at Fort Jennings Park as well. “Ted always puts in a lot of time at Fort Fest, which is the annual fundraiser for Fort Jennings Park. The Lions Club runs the duck races at the event and Ted lends his voice as emcee of the event as well as his sound equipment,” Gilchriest explained. Verhoff also volunteers his time at St. Joseph’s Catholic Church, organizing many projects, including landscaping and putting in new fencing. “Ted can always be found helping at the annual Lions Sweepstakes fundraiser (reverse draw), as well as cooking or serving chicken dinners on Mother’s Day at our Chicken Dinner fundraiser,” Gilchriest added. Verhoff also spearheaded gathering Lions members to cook lunch for the Student Council Convention when the Fort Jennings High School hosted the event last spring. “When the Lions put their famous float in the parades during parade season every year, you can bet you will hear Ted’s voice as well as his music playing over the loudspeaker to entertain the crowds,” Gillchriest said. He also stores all the props as well as the Lions float in his building. In addition to all the Lions projects, Verhoff also makes it a point to get younger members involved and even encourages them to take the lead on projects. “He likes to make it a point to be sure new members know what is expected of them as a Lions member and what being part of the Lions International is all about,” Gilchriest concluded.